› Author Affiliations Funding OPA authors performed this work under the employment of the federal government. ACOG authors performed this work under contract No. HHSP233201600276A. 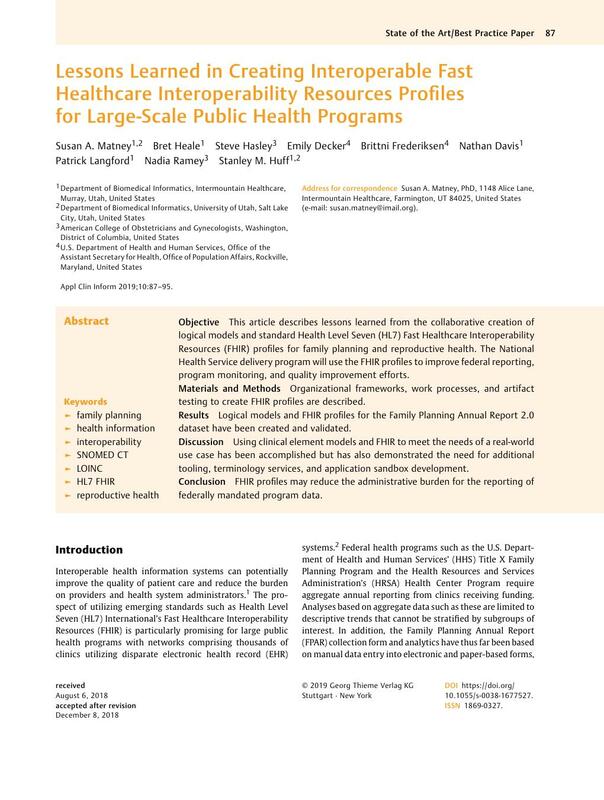 Objective This article describes lessons learned from the collaborative creation of logical models and standard Health Level Seven (HL7) Fast Healthcare Interoperability Resources (FHIR) profiles for family planning and reproductive health. The National Health Service delivery program will use the FHIR profiles to improve federal reporting, program monitoring, and quality improvement efforts. Materials and Methods Organizational frameworks, work processes, and artifact testing to create FHIR profiles are described. Results Logical models and FHIR profiles for the Family Planning Annual Report 2.0 dataset have been created and validated. Discussion Using clinical element models and FHIR to meet the needs of a real-world use case has been accomplished but has also demonstrated the need for additional tooling, terminology services, and application sandbox development. Conclusion FHIR profiles may reduce the administrative burden for the reporting of federally mandated program data. This project did not involve human/animal subjects.